From predicting emission lines of galaxies to identifying potential schizophrenia genes, there is no shortage for statistical applications. And for two years, undergraduates from around the country have come to Carnegie Mellon University to realize the possibilities. 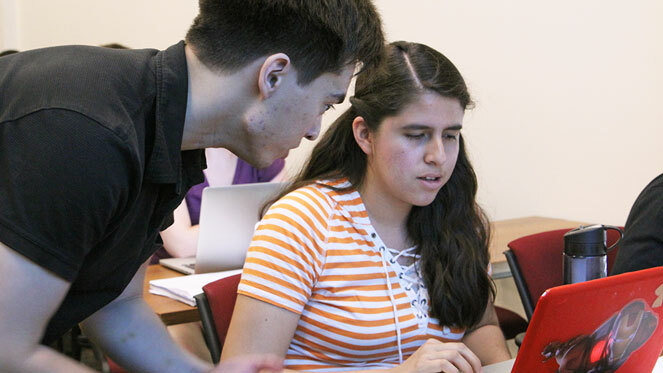 The Summer Undergraduate Research Experience in Statistics provides students with opportunities to work on real problems under the guidance of the department’s world-class faculty and current graduate students. Students come from a wide variety of disciplines, including math, economics and history — and leave with practical research experience, connections and a new perspective on career options for statisticians, including attending graduate school. For example, Rachel Borashko, a statistics and sociology major at Grand Valley State University, is part of a group that is forecasting flu trends. Borashko was initially drawn to the program based on CMU’s research strengths. “As someone who is considering graduate school and hopes to pursue a career in research, I’m grateful to be a part of the process now to better understand research at a practical level,” she said. And CMU is one of the best places for this kind of experience. “The students and faculty in the Statistics Department at CMU are all engaged in interdisciplinary research, working ‘in the trenches’ with scientists, policy makers and other researchers. We offer students in this program a taste of that experience,” said Christopher Genovese, head of the Department of Statistics. Another perk for Borashko is getting to know the faculty, graduate students and her peers. “The people really make the program. Everyone has been nothing but kind, welcoming and extremely helpful,” she said. Robin Dunn, a 2015 program attendee, agreed. “I gained insight from incredible professors who have become mentors, and I was inspired by the strengths and interests of my fellow student researchers,” said Dunn, who became passionate about statistics at Kenyon College where she majored in mathematics with a concentration in scientific computing. Through an ongoing research partnership between the Department of Statistics and the U.S. Census Bureau, Dunn wrote R code to help implement a method of record linkage across multiple data sets during her stint in the program. She will dive deeper into research in August when she becomes a Carnegie Mellon Ph.D. student in statistics. Though Dunn was accepted to several competitive graduate schools, CMU topped her list. Another 2015 program attendee, Benjamin LeRoy, will also begin work on his Ph.D. in statistics this fall at CMU. Although the program is not primarily intended to be a recruiting tool for the department, Chad Schafer, associate professor of statistics and director of the summer program, is not surprised that some of the participants end up returning for graduate school.